One year ago, more than 150 world leaders adopted the new 2030 Agenda for Sustainable Development, including the Sustainable Development Goals (SDGs). The 2030 Agenda outlines an action plan for people, planet and prosperity for all. It defines a new development framework that requires a widespread engagement of all, from national and sub-national governments to private companies, from civil society organizations to academia, and so on. It is clear that if the new 2030 Agenda wants to respect its commitments and be truly transformative – an Agenda “of the people, for the people, and by the people” –, it needs to be implemented and fully realized at the local level. Therefore, the localization of the new agenda, a process that envisages an effective landing of the SDGs into practices at the local level, will be the only way to have a concrete and positive impact on people’s lives. This shall entail the recognition and valorisation of local leadership in order to encourage local leaders to make the SDGs their own. The 2030 Agenda entirely embraces this local perspective underlining that “many of the investments to achieve the SDGs will take place at the sub-national level”. In order to support local and regional governments and other local stakeholders in this complex task, GTF, UNDP and UN-Habitat have supported the development of a pioneering knowledge and information sharing space, where local policy makers, development practitioners and other relevant actors can find practical and tested tools and examples that can be used to design development policies and efficiently implement them in line with the 17 SDGs. The virtual platform is conceived as a space for learning, sharing and discussing. Users can learn from past experiences and discover tested mechanisms that support the implementation and achievement of the development goals locally. 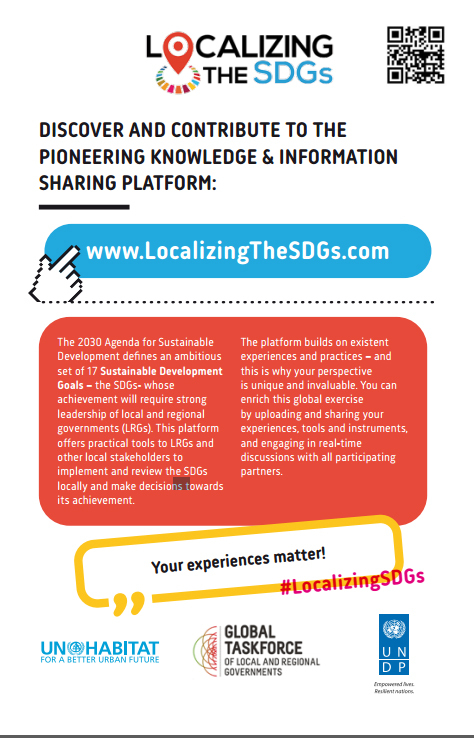 They are also invited to upload and share their experiences, tools and instruments, as well as engage in real-time discussions with all participating partners on the SDG localization. The platform provides concrete tools and practices to empower local governance stakeholders: first, by initializing the SDGs implementation process; second, by setting enabling institutional frameworks; lastly, by strengthening capacities. Watch this video to know more about the content and all functionalities of this web space and then, visit and contribute to the virtual platform. The experience of each one matter and by sharing insights and information, this collective effort will contribute to achieving sustainable development, making the global goals a reality for all.